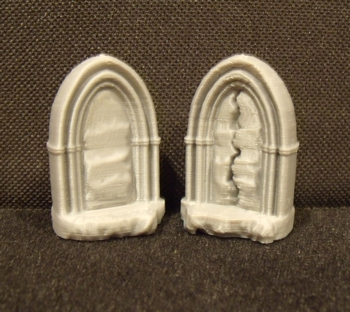 Stone Dungeon Door Miniature with 2 Sides There are 6 Reviews. The Stone Dungeon Door is another common type of door in tabletop games. Carved from solid blocks of stone, these heavy doors are often built so that they pivot when opened. Secret doors concealed within a stone wall are usually stone doors. Each Stone Door Miniature is made individually WITHOUT using a manufacturing mold.